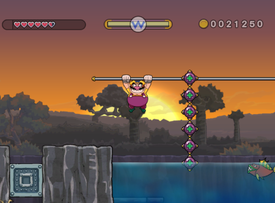 Savannah Valley is the fourth level of Wiggly Wilds in Wario Land: Shake It! The level begins with Wario entering a large cave. Inside, there are many bars that he can swing on to reach higher areas of the cave. In fact, the whole cave is filled with these swing bars, and it is also filled with coins and the rare golden enemy. Upon finally exiting the cave, Wario will be in grassy plains and take a platform to a higher cliff. Here, Wario will move across a bar while watching out for bombs. Wario will later enter another cave where he will meet a caged Merfle. When freeing him, an alarm will go off, making Wario run to the beginning of the level and finishing it. The escape sequence music is the same one from Just Plains.